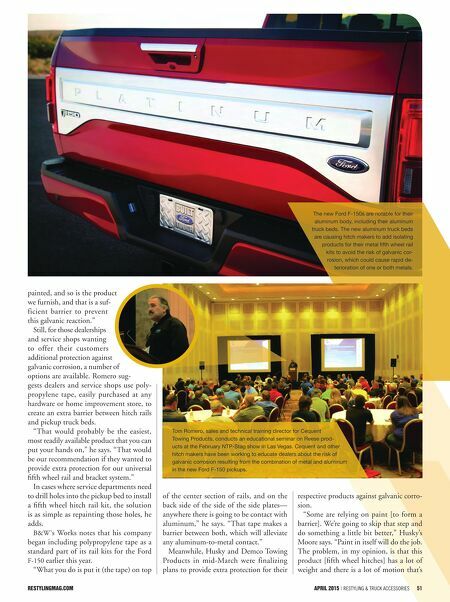 50 Restyling & tRuck AccessoRies | April 2015 restylingmag.com I n response to the launch of Ford's 2015 F-150 pickups, fifth wheel and gooseneck hitch manufacturers are implementing various strategies to guard against a poten- tially serious problem created by the inter- action of the new truck's aluminum body and their respective fifth wheel and goose- neck hitches' metal rails kits. The case of two different metals – steel and aluminum – coming into contact with one another in the presence of moisture can result in corrosion and the rapid dete- rioration of one of those metals, a con- dition known as galvanic corrosion. In a worst-case scenario, under specific condi- tions, there could be a small risk of fire if aluminum dust comes into contact with a spark. "There is definitely some concern. You risk that galvanic reaction if those two metals come into contact with each other," says Tom Romero, sales and technical training director for Plymouth, Mich.- based Cequent Towing Products. "Ford going to the aluminum body is going to have some adverse effects when it comes to using typical towing products, which are made of steel," agrees Chris Moore, senior engineer in steel products for Wilsonville, Ore.-based Husky Towing Products. Still, direct contact between Ford's alu- minum truck bodies and steel aftermarket accessories will generally be limited by paint, appropriate fastening hardware, and in some cases, bed liners, notes James Works, national sales manager, Humbolt, Kan.-based B&W Trailer Hitches. Repre- sentatives for other hitch makers agree. "One of the first lines of prevention is painted surfaces," Romero says. 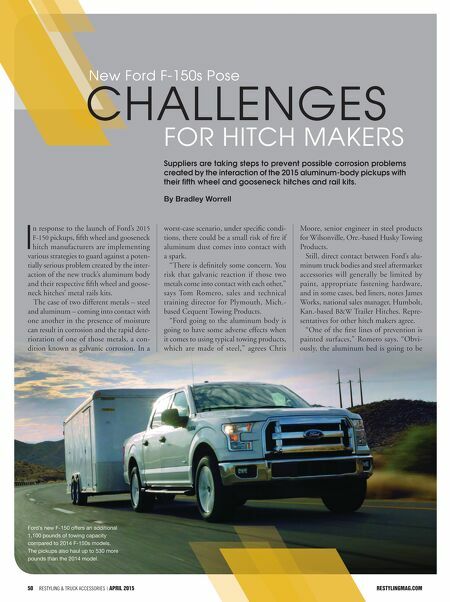 "Obvi- ously, the aluminum bed is going to be By Bradley Worrell New Ford F-150s Pose ChalleNges For hItCh Makers Suppliers are taking steps to prevent possible corrosion problems created by the interaction of the 2015 aluminum-body pickups with their fifth wheel and gooseneck hitches and rail kits. Ford's new F-150 offers an additional 1,100 pounds of towing capacity compared to 2014 F-150s models. The pickups also haul up to 530 more pounds than the 2014 model.